Hospitals can be incredibly confusing places. Endless, maze-like buildings, complicated medical jargon, mysterious insurance regulations, it all makes for some pretty big hurdles to overcome when you're trying to forge meaningful patient relationships. On top of that, the personal circumstances for visitors are often extraordinarily stressful. So it's vital that websites for hospitals meet these challenges head on, anticipating the needs of their patients, providing calm reassurances, and quick access to the most essential information. Of course, a website alone will not solve the myriad communication problems that hospitals face. It also must coexist with the personalized support and care provided by the living, breathing humans that answer phones, create pamphlets, and greet patients. 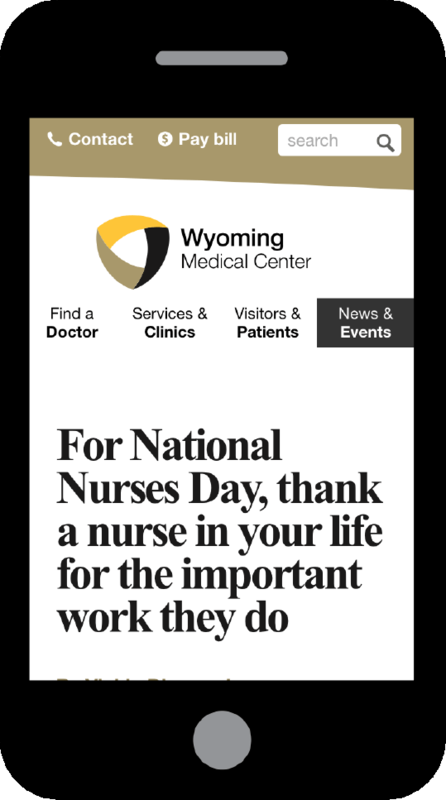 As the largest, most advanced hospital in Casper, the Wyoming Medical Center provides essential care to people across the entire state. They hired us to to redesign and unify three separate websites — applying and extending the best elements of a recent brand update. 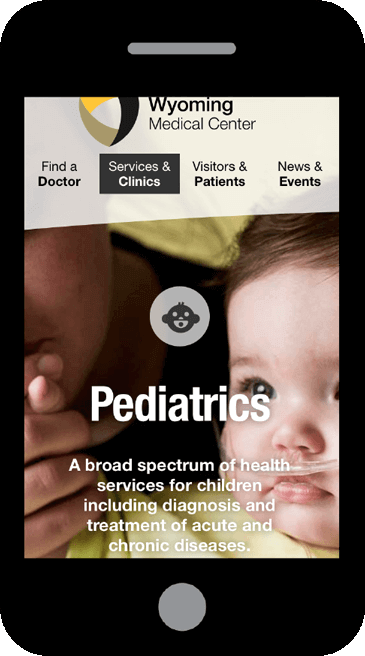 After a few days of examining data, interviewing stakeholders and absorbing as much information as possible, we learned that a huge portion of the audience uses the site on a mobile device either at the hospital, or on the way. Demographically, the audience leans older and more female. And with the unique and unfortunate realization that many visitors to a hospital website are in active pain, accessibility for this site became more important than ever before. To prepare for design and implementation, we did a content audit and competitive analysis, closely examined historical data analytics and ran SEO reports. All this data was assembled into a report that extracted the most critical metrics and would help guide the rest of our work. Since WMC had recently gone through a major corporate rebranding, we closely examined the general branding guidelines and saw how they had been applied to other projects. These included specifications for the color palette, typography, and stylistic layout recommendations in the form of brochures, signage and flyers. We embraced these constraints, adapting and extending them for the web with a digital styleguide. This living document defines the grid system, digital color palette, contextual typography, general iconography, form layout, and usage of rich media — like photo galleries and embedded videos. On the backend, their existing site had been built in ExpressionEngine (an extraordinarily flexible content management system). They were happy with the overall system — no need for an expensive migration — but it needed a thorough cleaning and some extra oomph. We updated to the latest stable release and tricked out their installation with commercial third-party add-ons to add advanced search, on-the-fly tagging, drag and drop content layout, our custom control panel theme and much more. To our great advantage, WMC possessed a stellar blog archive and has a talented writer on staff, constantly profiling new doctors, new treatments, sharing amazing stories of survival and loss. But this exceptional content was stuck in an old copy of Wordpress, relegated to a subdomain and loosely cross-referenced with the rest of the site. We imported everything into the content management system, redirected all the old links, and automatically cross-linked the blog content with related doctor bios, departments and clinics. The legacy comment system was rarely used so we replaced it with comments that synchronize conversations between the site and shared posts on Facebook. On top of that, we built a flexible layout system for producing richly layered content. This design system allows editors to insert photo galleries, sidebars, pull quotes and videos throughout a story while maintaining a consistent, tightly structured, responsive layout. It worked so well, we ended up using this editorial design system throughout the entire site, allowing anyone in the marketing department to create complex, interesting layouts on-the-fly without needing to fuss with code, or engage a developer. Our strategy emphasizes quality over quantity – developing longer, more immersive pages with similar content grouped together, and redundant content eliminated altogether. The overall site navigation system efficiently routes most visitors to the content they need with only one click. Throughout the site, the faces of individual doctors are strategically positioned to initiate a relationship before you step foot in an office. And a carefully constructed filtering system makes it easy to find a specialist with either medical or colloquial terminology (e.g. orthopedics vs. bone and joint). The new site launched April 2, 2016, on lightning-fast managed servers at one of our favorite hosting companies, ArcusTech. The results of our efforts were immediately obvious, with nearly all analytics data trending positive. 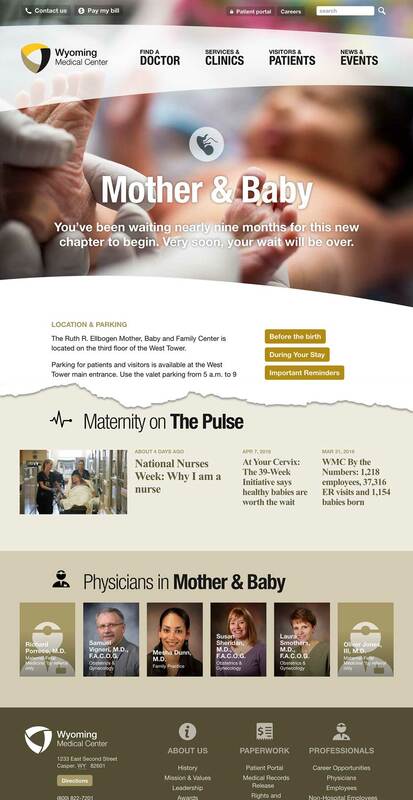 We continue to work on the WMC site, fine-tuning, optimizing and perfecting the experience based on feedback from patients, staff and the community. We want to work with you! 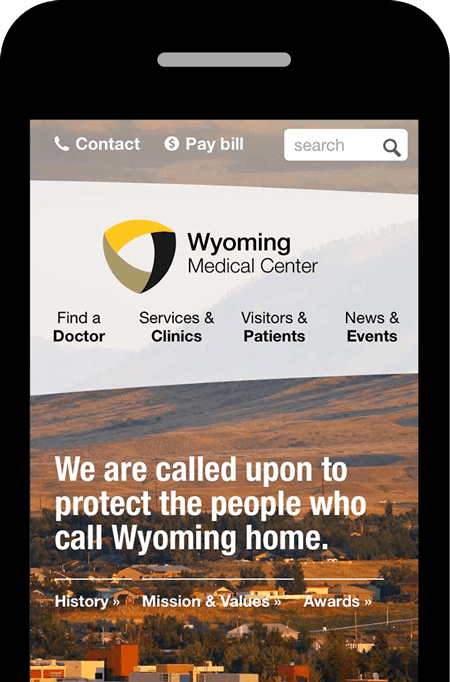 Contact us if you want to improve your website and see results like Wyoming Medical Center. Schedule an initial call right now, or send a quick note and we’ll talk soon. Why are you writing us today? Thank you for writing. We will be in touch soon.